The next AREG General Meeting is on Friday the 21st of November, at the Reedbeds Community Hall doors open 7:45pm. This month there will be a short 30 minute business meeting held starting at 8:00pm sharp. This month we will try a new format for the meeting in an effort to streamline proceedings. This month we have arranged Mark VK5QI to present a technical talk entitled “<Insert Radio Name Here> – A open source teaching SDR for Linux Conf 2015”, starting at 8:45pm. In this talk Mark will discuss the Softrock-based SDR he is developing for the Open Radio Mini conference, to be held at “Linux Conf 2015” in Auckland, New Zealand. 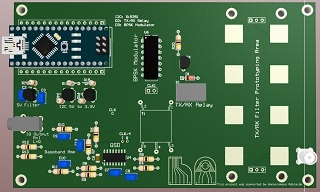 Some basic SDR theory will be covered, along with some demo’s of the prototype kit. We’re certainly fingers crossed that by the time our meeting comes around that this radio has a project name ! After the presentation there will be the usual “rag chew” over coffee, tea and cake until stumps.